Beyoncé announced on Instagram that she is once again pregnant, a revelation that sent the social media world into a frenzy. Choose your channel wisely. While many influencers might choose to announce a major life event on a text-based platform, Beyoncé posted her announcement on Instagram, the channel where she has the largest following, compared to Twitter (14.7 million followers) or Facebook (64.5 million likes). It’s also the channel she posts most frequently to—the most recent posts on her Twitter and Facebook pages are from April 2016, when her visual album “Lemonade” was released. 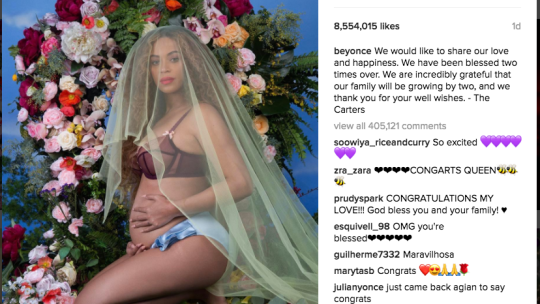 Posting her pregnancy announcement to Instagram rewarded Beyoncé’s most loyal and largest group of social media followers, which is perhaps what made the post go viral so quickly. Likewise, PR pros should always make major announcements on the channels where the largest portion of their audience spends their time. Build it, and they will come…to your website. The Instagram post was one of several pregnancy photos—in fact, an entire photo album titled “I Have Three Hearts” was released—on Beyoncé’s official website the day after the post. After dropping the bomb on Wednesday, the star waited for the internet to freak out before releasing the lion’s share of her pregnancy photos. Communicators could experiment with a similar technique—giving audiences just a taste of content, and allowing buzz to build before the big reveal. The post and subsequent album release is also an excellent study in using social media for a call to action. Visual platforms thrive on authenticity. The shots reveal a more maternal, softer side of the fierce songstress than we’re used to seeing. The simple lingerie, rounded stomach and veiled visage give the image an intimate feel, like we’re celebrating the moment with her. These authentic, human moments lend themselves to high engagement on visual platforms like Instagram and Snapchat. Modeling this idea, communicators might consider adding a human element—an employee, a client, a fan—to their next Instagram announcement, giving the audience an emotional point of connection. Want to learn how to drive more engagement across your social media channels? Register for PR News’ Digital Summit, Feb. 24 in Huntington Beach, CA to hear from brand communicators at TOMS, Boingo Wireless, eHarmony and more on how they build audiences through visual storytelling and content strategy. While PR pros probably can't claim the nearly 100 million Instagram followers the pop icon boasts, there are a few major takeaways to consider the next time your brand has a big announcement.